Yesterday was the last day of the Promotional Products Association International’s 2018 expo, but that doesn’t mean we rested on our laurels trying to find great products our clients. If you haven’t seen what we loved from the first two days, be sure to check them out! Check out our favorite items from our last day at the show below. We live in a world where everyone is attached to their phone. If the battery life dips below 20 percent? A small amount of nervousness begins to set in. Ten percent? You start using your phone as little as possible to keep it alive until the next opportunity to charge arises. Five percent? Full-scale panic as finding an outlet becomes almost as important as water in the desert. Never worry about your phone’s battery again with the Juice Box Zinc 5000. 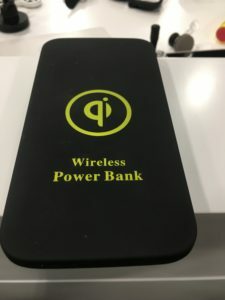 The Juice Box Zinc 5000 can charge any USB device with a cable, but what sets this product apart from other power banks is the ability to you can also set your QI integrated device on top of it to charge wirelessly. With Apple introducing wireless charging in the iPhone 8 and iPhone X, they’ve joined the Samsung product line and have essentially made wireless charging the industry standard. If you’re looking for ties and scarves that are made in the United States and are looking to support a company that has a social mission, then ties from Knotty will be perfect for you. Knotty creates employment opportunities for refugees from war torn areas of the globe like Syria, Somalia, and Eritrea according to their existing skills. This includes jobs like designer, seamstress, and tailoring. Another piece of their social responsibility mission is to teach skills to single mothers while paying them a good wage and giving them ample personal time off. The products they make are also outstanding. Their ties and scarves are eco-friendly as they’re made of entirely recycled material. They are also completely customizable with color matching and sewn to specific cuts. 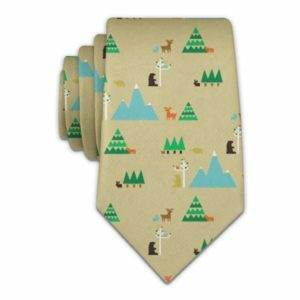 These ties are great whether you’re ordering one or ten thousand, and you can just order one because there are no minimum orders. The Spectraflex Luggage Tag makes luggage standout from the rest of the boring tags at baggage claim. 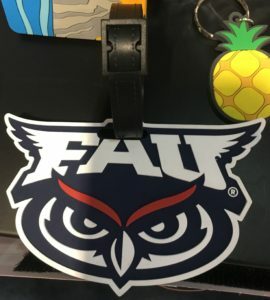 This colorful, flexible, and durable tag would be a perfect item for universities to give to students studying abroad. Not only will your logo be with them during one of the most exciting times of their life, its durability ensures that it will go with them on every trip they make for years to come. These luggage tags are custom molded to your design and include amazing small detail reproduction. The back comes with a paper insert for name, phone number, and address, but the color of the back is also entirely customizable. We had a great time at the 2018 PPAI Expo, and we’ve got even more great products and industry trends to share with you! If you’re interested in any of the products we’ve written about, or any other product, just email your Account Manager to set up a time to chat!